 Mouse anti Human PAPP-A antibody, clone 10E1 recognizes human pregnancy-associated plasma protein A, or PAPP-A, a metalloprotease specific for insulin-like growth factor binding protein-4 and -5 (IGFBP4 and IGFBP5). PAPP-A was initially identified as a high-molecular mass component in human pregnancy serum. In pregnancy serum PAPP-A exists in a disulfide bound heterotetrameric complex consisting of two ~200 kDa PAPP-A subunits and two ~50-90 kDa subunits of the proform of eosinophil major basic protein (proMBP). The concentration of PAPP-A in serum increases with gestational age, however, in Down’s syndrome pregnancies PAPP-A concentration is markedly reduced in the first trimester. As such, PAPP-A is widely used as an early marker for Down’s syndrome. PAPP-A has also been shown to exist in a homodimeric, 400 kDa form in unstable atherosclerotic plaques. Increased circulating concentrations of this dimeric PAPP-A are associated with acute coronary syndromes. Mouse anti Human PAPP-A antibody, clone 10E1 recognizes both the heterotetrameric complex (PAPP-A associated with proMBP) and the homodimeric complex of PAPP-A.